Greetings friends and fellow crafters, LeeAnn here today with a clean and fairly simple card using the Sending Hedgehugs stamp set from Lawn Fawn. This and many other fun sets can be purchased at White Rose Crafts. In order to make this card I first used a stitched circle die to cut out my red circle. I used double side Adhesive Sheets to adhere the circle to my light pink panel. I then cut the panel to 4"x5.25" and using a Darice Embossing Folder and my Big Shot I dry embossed that panel to use as my topper. From there I stamped the Hedgehogs using Memento Tuxedo Black ink, and colored using Desert Sand and Rich Chocolate Memento Markers. I then used the matching Dies to cut out the images. 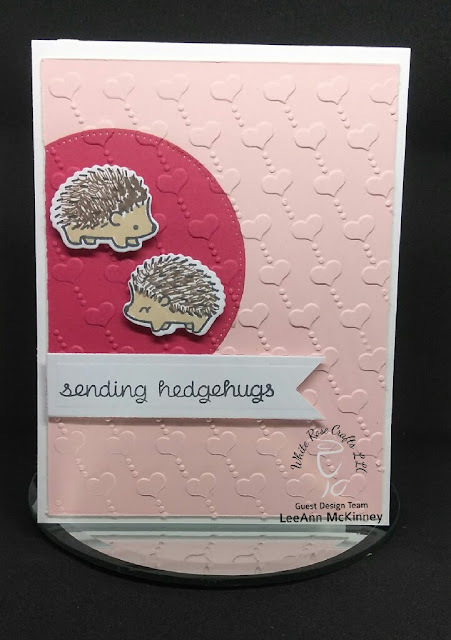 Using a Spellbinders rectangle die I cut a panel using white cardstock and stamped the "Sending Hedgehugs" sentiment using the same Memento Tuxedo Black ink. All paper in this project is Recollections, the white is 110 lb, pink/red is 65 lb.